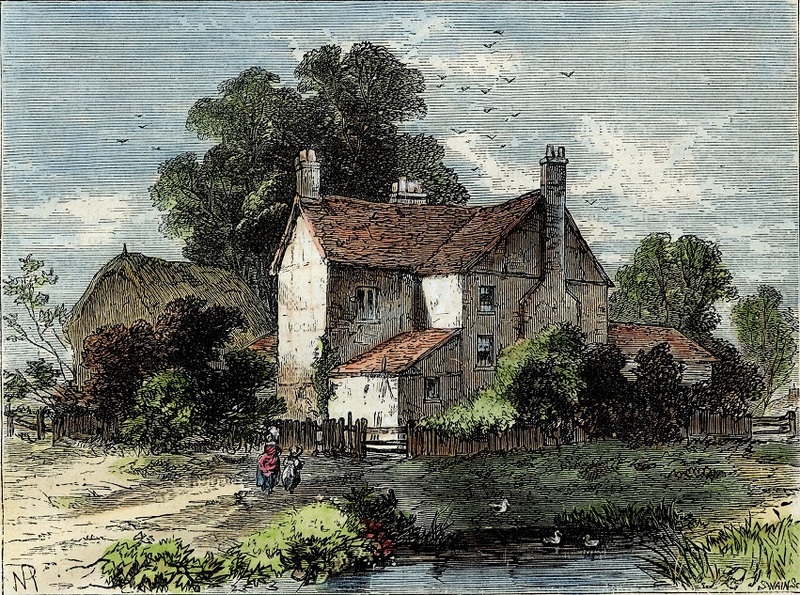 Among the many William Luker illustrations to Loftie’s Kensington: Picturesque and Historical is this one. At this size it just looks like a mound or hill with a small crowd of people and a few horses. But click on the image and look at it in a larger form. Some of you will have heard of it before. 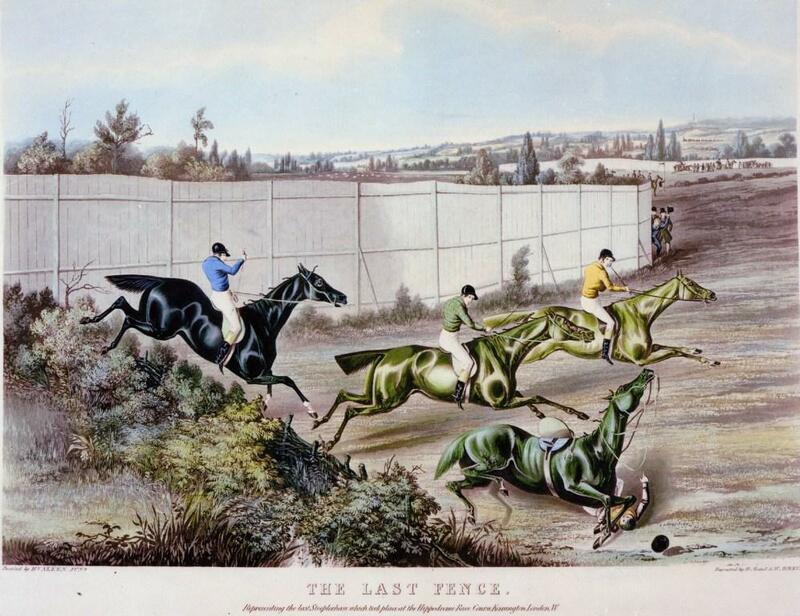 Its story has been told before in many places, but for the benefit of those who are unfamiliar with Kensington’s famous race course, today I’ll give you a brief version of the tale. 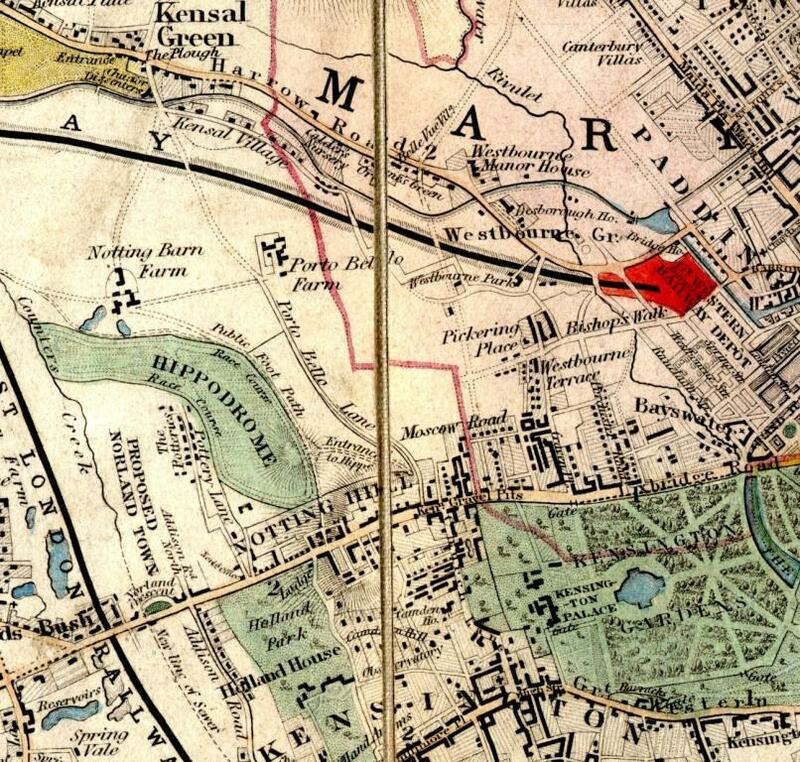 This is the Davies map of London from 1841, the first to show the main rail lines into central London. The area north of Notting Hill Gate / Uxbridge Road is barely developed and you can see just south of the railway line the two farms Portobello Farm (just off Portobello Lane) and Notting Barn Farm. Given the Hippodrome’s brief life span, we’re lucky it made it onto the map. 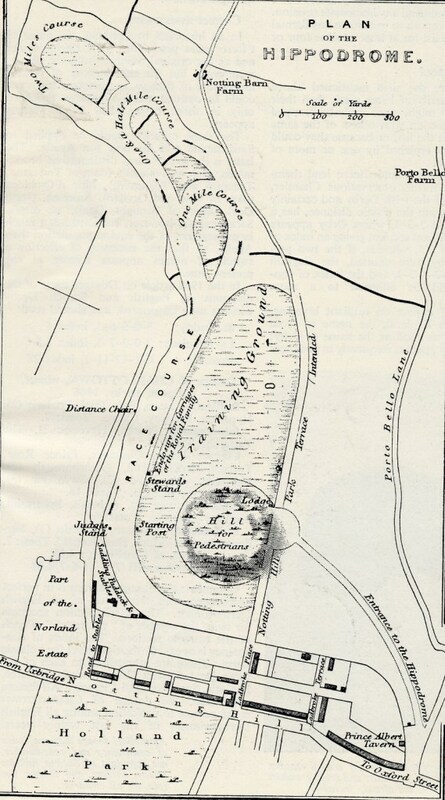 Counter’s Creek flows freely to the west of the Hippodrome grounds and the area known as the Potteries nestles against them. Just the sort of area for setting up a sporting enterprise.The area was part of the Ladbroke Estate and in 1836 it was optimistically leased by a Mr John Whyte foe a period of 21 years. On paper perhaps it looked like a decent proposition. 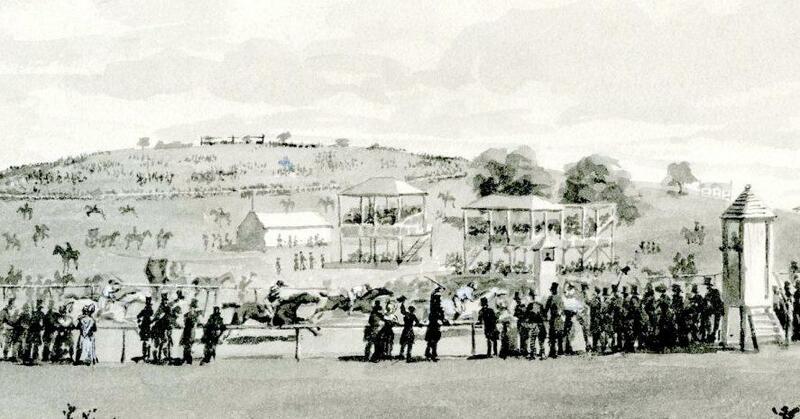 Plenty of space – it was laid out for flat racing and steeple chasing, and the area was expanded to accommodate different distances. There was room for stabling horses and carriages and as you can see below it was fine for a young man to drive a young lady there in his new carriage and pair. Room for plenty of enthusiastic spectators too. Saying it was in Bayswater added a certain cachet to the name. So close to London you see. No need to go to Epsom. There were one or two legal issues. A right of way went through the grounds, which the Vestry has ordered Whyte to keep open. This allowed an uncouth crowd of locals and other malcontents to gain free access. Eventually the course was altered so as not to obstruct the pathway. On the plan below you can see that the entrance path stretched all the way to what is now Pembridge Road. Barbara Denny, in her book on Notting Hill records that the path became known as Cut-Throat Lane because of the many instances of robbery committed along it. (although we must remember that street robbery was not uncommon in the outer parts of London . The area known as the Five Fields in Knightsbridge was notorious for violent crime too. 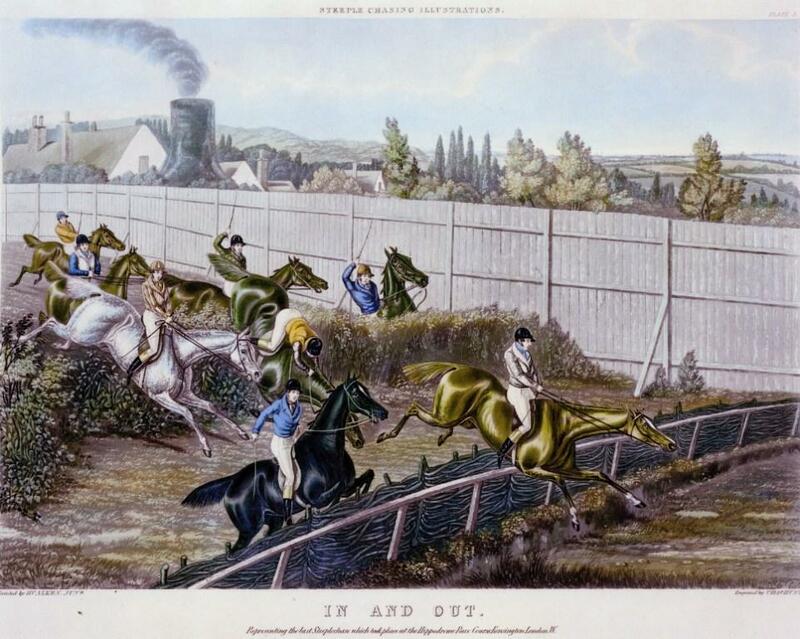 We have a series of prints depicting the racing at the Hippodrome. This shows the high fence that was erected around the ground, (to exclude, in the word of my constant companion the Survey of London “the rude and licentious populace” of the neighbourhood,) The smoking kiln in the background reminds us how close the Potteries area was. Some chaotic jumping, and below a fallen horse. Unfortunately the going was never too good because of the clay soil. 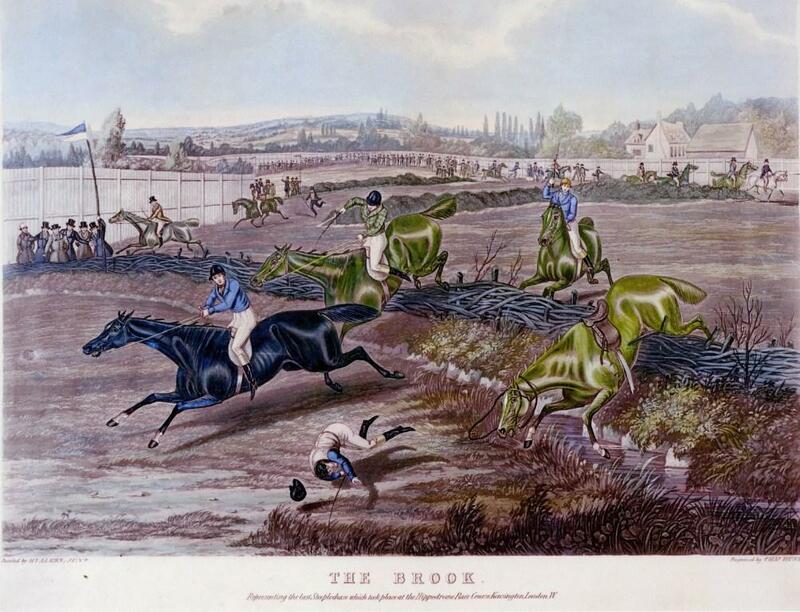 Below a rider is unseated at the Brook. You will have noticed that the horses are depicted with all their legs outstretched in what is known as a “flying gallop”. This was a convention of horse pictures which can be seen in ancient pictures of horses in motion and in the work of the 18th century painter of horses and other animals, George Stubbs. 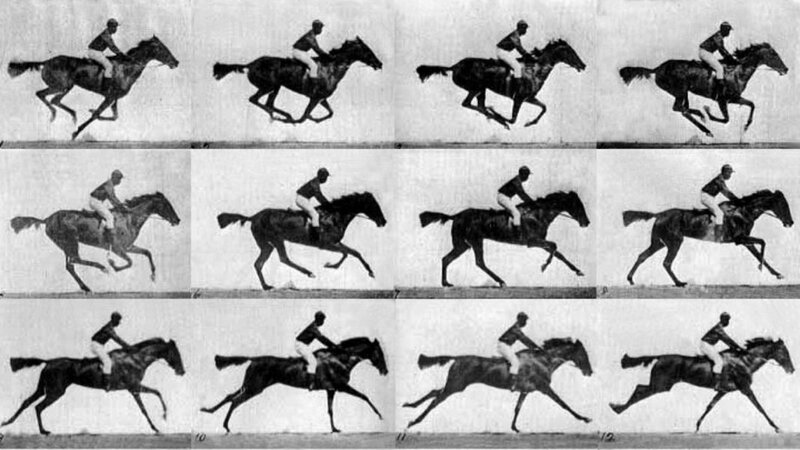 Slow motion moving pictures were not available in the days of the Hippodrome, so while it’s easy for us to say things like “horses just don’t do that”, it wasn’t actually obvious to the naked eye. 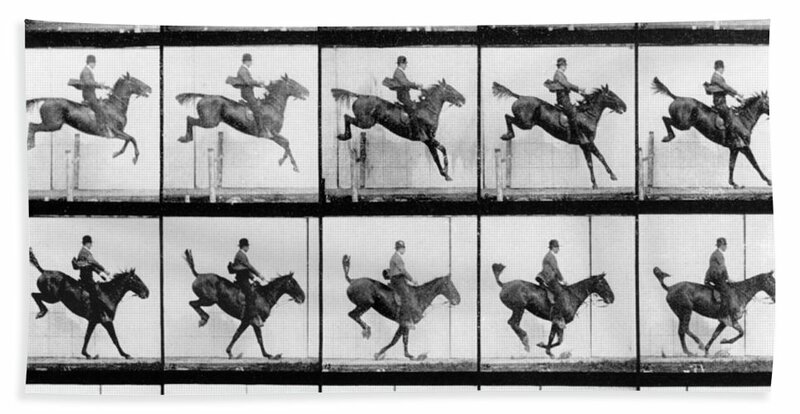 The first person to prove otherwise was the pioneering photographer Eadweard Muybridge who devised a method of taking a number of pictures in rapid succession which captured the actuality of horse locomotion. His work also gave rise to an early form of motion pictures, the zoopraxiscope, which could project these images in rapid succession creating the illusion of movement. An early form of stop motion filming. Kingston Museum has a special collection of Muybridge material including an actual zoopraxiscope. Even Luker, who was certainly around when Muybridge’s Animal Locomotion was published keeps this convention up in this close up of his illustration. The crowd of spectators looks carefree. 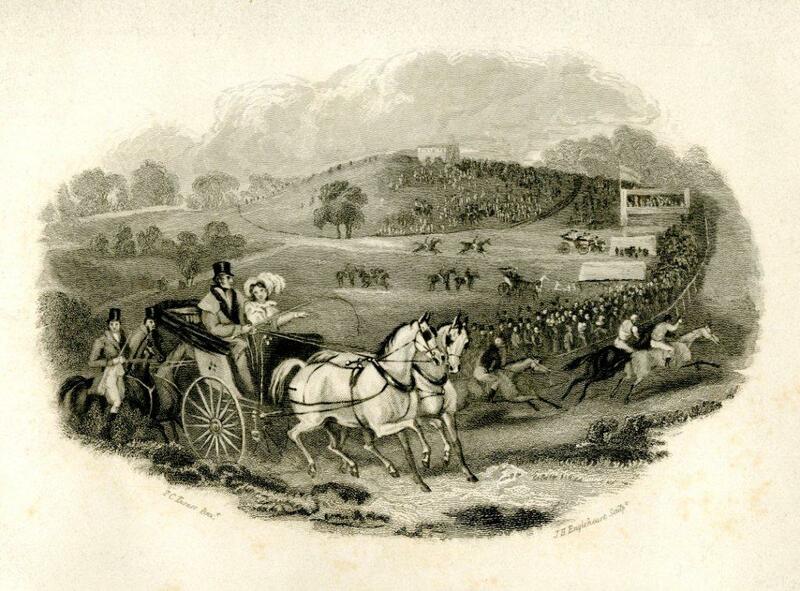 By Luker’s day the Hippodrome was a picturesque memory. 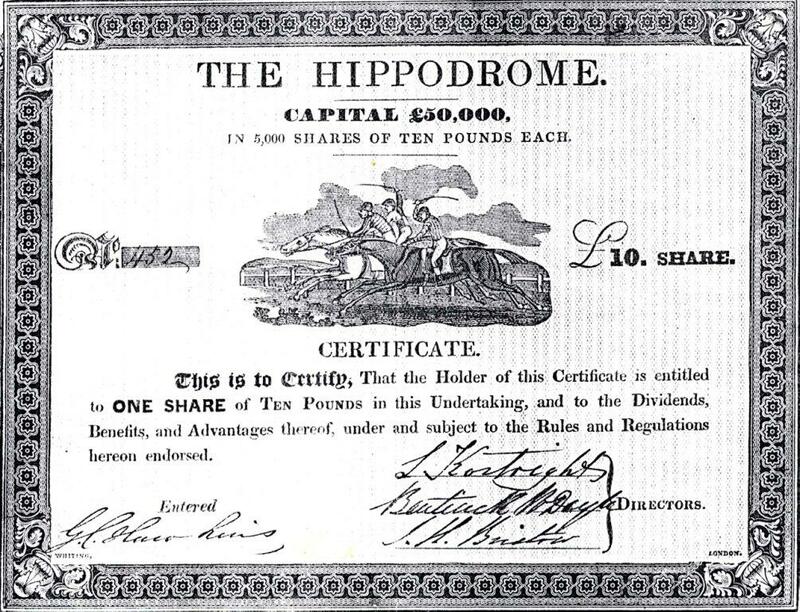 After 13 race meetings the Hippodrome was wound up. 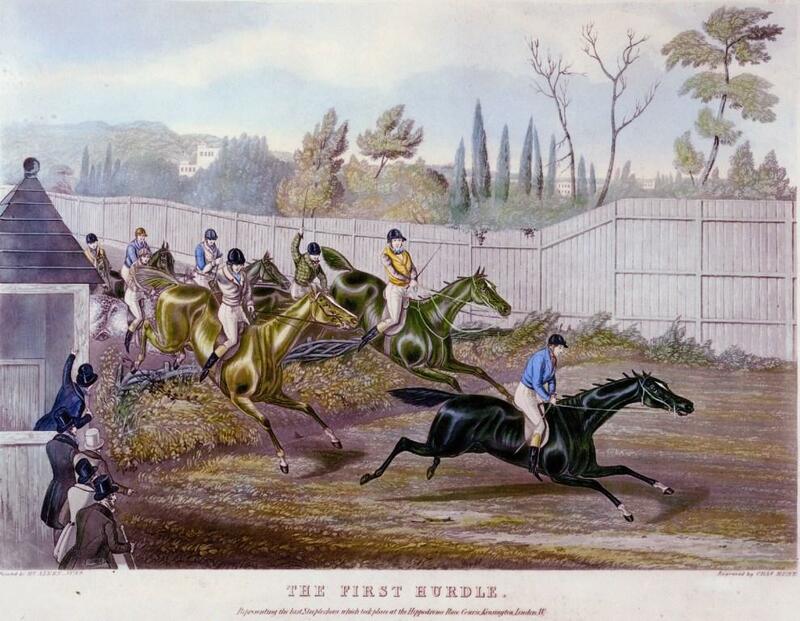 A new proprietor took over but the final race took place in June 1841. The developers moved in and Notting Hill as we know it today came into existence. 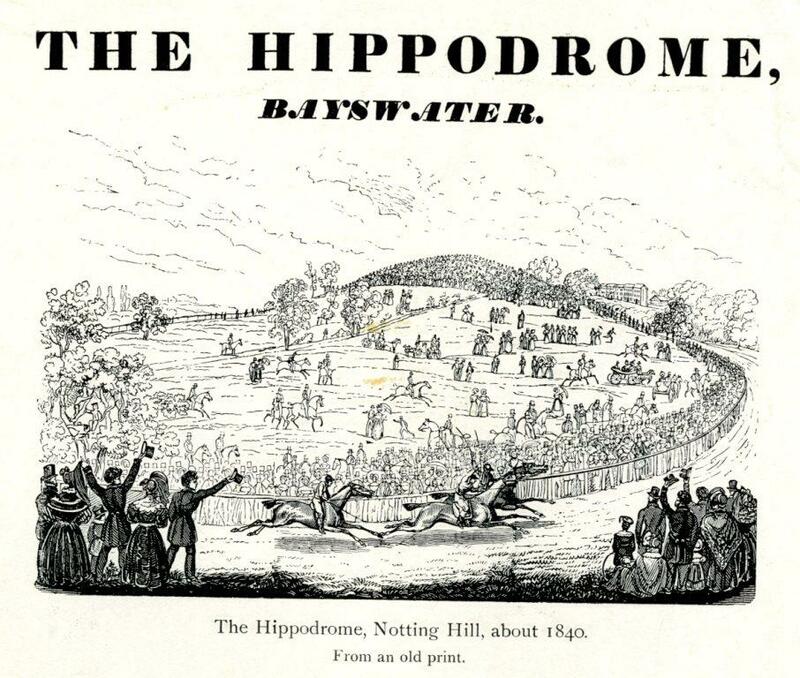 But that memory of the Hipodrome remains as an example of how in early and mid -19th century times, Londoners had an urge for outdoor entertainments which only grew as the century progressed. This entry was posted on Thursday, December 6th, 2018 at 2:30 pm	and tagged with The Hippodrome and posted in 19th Century, Kensington, North Kensington. You can follow any responses to this entry through the RSS 2.0 feed. What a pleasure to read, for one who previously lived atop the hill [Lansdowne Circus]. I use the Davis map often, but had never looked at this area, so did not realise that the horses once thundered through our basement! Incidentally, is not the GWR shown as terminating at what became the goods station, but perhaps you did not comment on this as it is ‘out of area’?